Solar Efficiency: It’s Not What You Think, Part 2 of 2. Chris Warren May 15, 2016 May 15, 2016 1 Comment on Solar Efficiency: It’s Not What You Think, Part 2 of 2. In Part 1 we started with some conceptual topics, then moved on to the physical hardware that is the cause of inefficiency. In Part 2 we’ll address batteries, then go step by step through a typical system and identify where solar efficiency is compromised. Calculating battery efficiency is very difficult because there are so many variables. The type of battery, its age, ambient temperature, state of charge, the load on the battery, how well it is maintained, and the characteristics of other batteries that may be connected with it all come into play. The available data states that in general, a common wet cell leaded battery is about 85% efficient. That means if you give it 100 watt-hours of charge, you will get 85 watt-hours of energy back out of it. That sounds pretty good, but as always there is a catch. These numbers are derived from strictly controlled lab tests, not real life. In my real-world experience, it’s more like 60%. It’s not helpful to have a solar panel throw a lot of energy at a battery and then not be able to get enough power out of the battery later. One or more of the following is happening: 1) The battery is too inefficient, possibly due to defects, age, or poor maintenance, so you feed it a lot of watts but it never really charges; 2) the solar panel capacity is too small for the size of the battery. The battery is essentially “starving” and never gets to full charge. Battery size & solar efficiency. What you get out of a battery in proportion to what you put into it is what determines solar efficiency. The size of the battery is not relevant. A small battery that is properly maintained and charged is going to be more efficient than a large battery that is neglected. It’s important to explain that efficiency and capacity are not the same thing. Capacity is defined as the maximum total energy that a battery can store or produce. Efficiency is how much energy remains in the battery after a charge as compared to the total charge applied. It is entirely possible for a battery to have more capacity but less efficiency than a smaller battery, or for two batteries with the same capacity to have different efficiencies. This is why simply installing a bigger battery does not by default give you more solar efficiency. It may actually give you less! One way to counteract the limitations of batteries is to have enough solar capacity to both support your expected load and charge the battery. In this scenario, your load will be powered by the sun energy alone and the battery will not discharge. Of course, due to varying sunlight this scheme will not work all the time, but it is an easy way to stretch your battery. Every minute you can run exclusively on solar without tapping into the battery is one more minute of battery time later when conditions are poor. 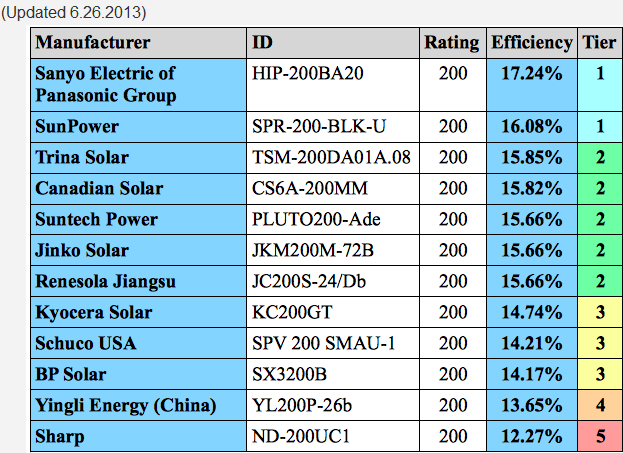 What you need to know: True battery solar efficiency is very difficult to determine. Never take the battery manufacturer ratings at face value and always assume you will get much less than what published data claims. Although Off Grid Ham favors facts over guesswork, this is one area where you’ll have to employ a mix of rough numbers and gut instinct. Over time you will intuitively know what you can get out of your batteries. Inverters: It takes some to make some. If you are using an inverter, it too will have a tare power of up to 20 watts depending on the size and design of the inverter. Again, the exact amount should be in the manual. The tare power will increase slightly when the inverter is under load. To save on your battery and improve your solar efficiency, turn the inverter off unless you absolutely need it. There is no point to having an inverter sucking up watts just sitting there doing nothing. What you need to know: Inverters are a big source of tare loss but they don’t necessarily need to be on all the time. They are an important part of any off grid system so it is a loss one just has to accept. You can save some watts by turning the inverter off when not needed. Solar panels are about 15% efficient, so it takes the equivalent of 700 watts of sunlight to get 100 watts out of a solar panel. On Earth, the strength of the sun can go over 1200 watts/square meter, but a solar panel will not produce more than it is rated for no matter how much sun shines on it. Starting power =100 watts out of the panel. 98 watts in – controller inefficiency – tare loss =74-89 watts net depending on whether we are using a PWM or MPPT controller. The battery is about 85% efficient, and keep in mind that is a very generous estimate. Sixty percent is not unrealistic. Calculating the loss from the battery is not really dependent on how much power coming from the controller because applying a higher charge wattage does not give the battery more capacity or efficiency, it only charges the battery faster. A less efficient battery will either need to be charged more often an/or require a more powerful charge. That’s where the real loss is, and there is no accurate way to calculate an exact number. We’ll come back to this in a moment. 74-89 watts –10 watts inverter tare loss =67-79 watts net. If you are not using an inverter, or the inverter is off line most of the time, then this loss is eliminated. That’s ten extra watts available to do something else. Let’s circle back to those batteries. Fussing over battery solar efficiency is somewhat quixotic. Why? Because it’s very difficult to pin exact numbers down and they constantly change anyway. Furthermore, the net leftover charging power is either enough or it’s not. If the total of 67-79 net watts is enough to keep the batteries up, then we’re good to go. If not, we need to add more solar panel capacity, reduce the electrical load, or find more efficient batteries. We also have to consider that the sun will not be strong all the time. That 67-79 watts is the maximum we’ll ever get out of our hypothetical 100 watt system during peak sun. Most of the time the output will be much less, and of course at night it will be zero. What you need to know: By time we get to the end of the chain, we have barely 10% left out of the original 700 watts of sunlight energy. That sounds discouraging, but remember that the fuel is free & (mostly) unlimited, so we are not focused on how much is needed on the front end. We really only care about what comes out, and the goal of the radio amateur is to minimize the losses within the system. Even with losing 90% of the original energy, we are still getting a lot of useful watts. That is what makes solar worth doing. Key points–what you need to know from parts 1 & 2. Focus on the technical and monetary cost of converting the fuel to electricity, not the fuel itself. The Law of Conservation of Energy states that energy can be neither created nor destroyed; it can only be changed from one form to another. Charge controller and inverter tare loss contributes to inefficiency. Turn the inverter off when not needed to improve overall system solar efficiency. Battery solar efficiency is difficult to determine but you should assume no battery is as good as the manufacturer claims. Following solar efficiency from beginning to end through the system, the net result is you will get less than 10% of the original energy that hits the panel. Don’t worry. You’re still getting plenty of useful power and the fuel is free anyway. solar efficiency: The relationship of how much electrical energy comes out of a system compared to how much solar energy is put in. the Law of Conservation of Energy: A principle of physics that states that energy cannot be created nor destroyed. It can only be changed from one form to another. capacity: In batteries, the maximum amount of energy a battery can store or produce. This is not the same as efficiency. tare loss, tare power, vampire power: The amount of energy a device will consume to support its own internal circuitry and functions over and above energy required for the device to perform the actual task it is designed for. There are many variations of this term. The Sun is so powerful that even with high losses solar energy is still practical and viable. The real challenge to the radio amateur is having a system that has enough solar efficiency to overcome the losses and produce enough electricity to meet expected needs. With current technology, this goal is relatively easy to attain. Your results will vary from what is presented here, but the basic idea is the same: Focus on the process, not the energy source, and you’ll get good results. Great information, Chris. Thanks much.